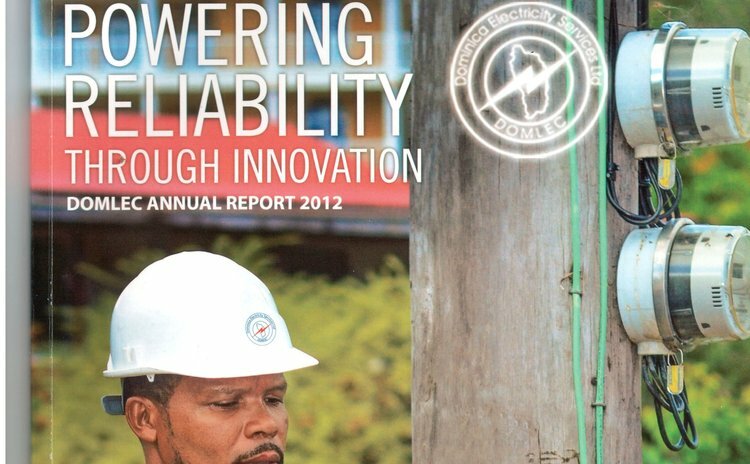 A number of other lights and power companies in the region recorded decline in sales in 2012 but the Dominica Electricity Services (DOMLEC) led the way with a 1.4 percent increase. "Despite the slight growth in sales the company recorded a better fiscal performance than in 2011 due largely to improved control of spending for both operating and capital expenses," wrote DOMLEC's chairman, Robert Blanchard in the just-released 2012 Annual Report. "Consequently the company's year-end results showed $8.2 million profit after tax. This fiscal discipline enabled the payment of dividends of EC$0.20 per share during the year." In 2011 the Company recorded profits of EC$7.75 million. "The commercial sector was affected in the earlier part of the year by the closure of a business unit of a major customer. By the end of the year, sales in the domestic and commercial sectors showed modest growth of 1.6% and 2.2% respectively. The 4.1% growth in the industrial sector was due to the ongoing expansion of a single major customer," the report stated. "The hotel sector however recorded a sharp decrease in sales of 35.2% as several players within the sector were reclassified from the hotel to domestic sector as they converted their hotel rooms to apartments". According to the report, total revenue increased by EC$9.0 million above 2011 to EC$107.4 million, due mainly to the fuel surcharge which amounted to $44.26 million compared to $36.66 million in 2011, an increase of $7.60 million. Total revenue from electricity sales for the year was EC$61.6 million. The Company's direct expenses increased by EC$10.2 million or 13.9%. The main causes of the increase were fuel costs which totalled EC$51.7 million, EC$8.7 million or 20.3% higher than 2011, and accounts for 61.4% of all direct expenses. For this fiscal year, there was a greater dependence on diesel generation occasioned by a 25% reduction in hydro production when compared to 2011. "The production from the hydro units fell to 26.7 GWh or a 25% decline against the 2011 production of just under 36 GWh. Note however that 2012's total rainfall of 4,737 mm was the lowest recorded since 2001. Despite the extremely low level of rainfall, 2012's hydro production represented the second highest in the last six years (from 2007)," DOMLEC stated. DOMLEC boasts that it was able to reduce the number of hours lost due to generation failures to 3.9 hours down from 8.8 hours in 2011. On the outstanding issue of an extension of its operation licence, DOMLEC said it has argued for the granting of a single licence which would be non-exclusive for generation but exclusive for transmission, distribution and supply. "However the IRC's preference was for the issuance of two separate licences. The first a non-exclusive licence for generation and the second an exclusive licence for transmission, distribution and supply of electrical energy used in the Commonwealth of Dominica," Blanchard said in his report. Taking a long-term view, Blanchard said in 2012 DOMLEC began setting aside EC$2 million from its profits as a self-insurance fund for the company's transmission and distribution assets. "The company obtained government approval for the establishment of the fund but has been awaiting legislative enactment of the required regulations for the past year," Blanchard said. A new company will issue the 2013 report since DOMLEC recently disclosed that Light & Power Holding of Barbados has acquired majority shares in DOMLEC.